Michele Bilyeu Creates *With Heart and Hands*: Now That I Have Your Attention! My blog's link list gadget is refusing to update along with my newest blog posts! Come on over and check out my blog for new posts anyway! Right now, the link list is stuck on the cute little picture of Pookie the dog we took care of until we found it's owners. By creating another brand new post (this one) I tricked blogger into updating as the last one refused to change! 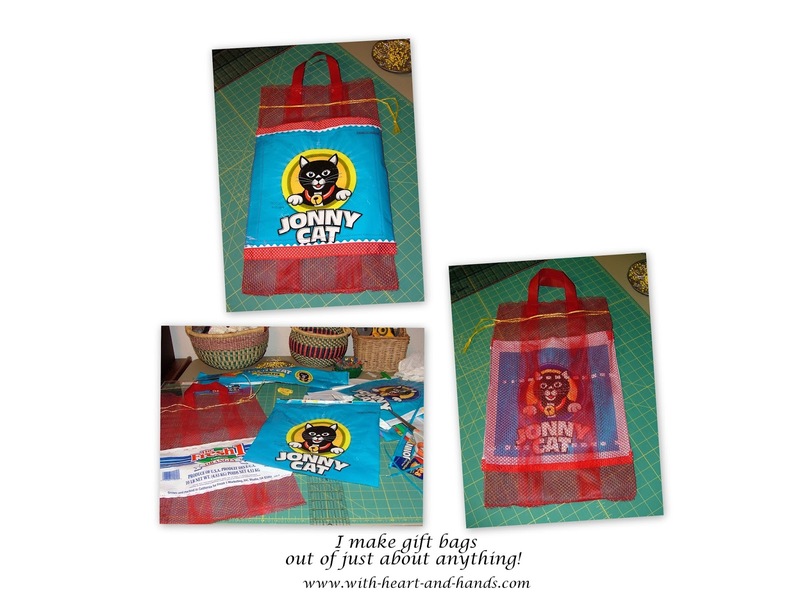 I have a grandcat named Johnnie and thought this made a cute gift bag for my daughter-in-law's birthday gifts. Literally speaking, pardon the pun, it really turned out to be cute! I wrapped up a few little gifts, made my own homemade card, stuffed them inside, pulled the little drawstring closed... and I was quite tickled with my clever recycling! My sweet little grandcat is a black and white tuxedo cat and looks an awful lot like this little fellow. He even wears a red collar! And speaking of red...check out my real blog post that has been updated with some Valentine gift ideas fun! Hi Michele - I've been reading your blog for quite some time, I recently started following via Bloglovin so I've been getting your posts regularly. I very much reading because you've always got something interesting to say! Thanks for sharing.